If you can't send someone to Paris, send a little Paris to them. 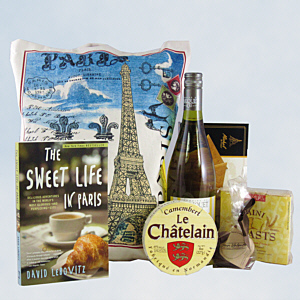 Packed in our charming Paris tote the focus for this gift is the book The Sweet Life in Paris written by pastry chef and award winning blogger David Lebovitz which details his decision to start over when he moved to the City of Lights years ago. It is a deliciously funny look at the city of lights, cheese, chocolate, and other confections. His humor and over 50 recipes make this book a great gift in itself. We've added to this sweet life by including Tariquet Chardonnay (unoaked,bright and clean), Butter Biscuits,Fresh Chocolate Truffles, Camembert, and Petits Toasts We also have a version with red wine or our Sparkling Elderflower Presse.